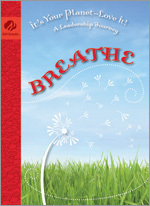 Air is here, there and everywhere in this journey for sixth, seventh and eighth graders. As the girls explore the air all around them, they'll learn a lot of air-clearing strategies, including how to turn down the volume! That means they'll be improving their personal air space - and finding the breathing room necessary to be leaders who make the most of their special flair! The Cadettes will also meet scientists, engineers, writers, and artists - all of them working for Earth's air and a cleaner world in which to live! This book is imported.